Why go through the motions of preparing an entire turkey this Thanksgiving? 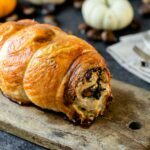 This turkey roulade stuffed with a pancetta and kale mixture is much easier and super delicious! Melt butter over medium-high heat in a 12-inch skillet. Add pancetta and sauté until the pancetta begins to brown on all sides, 3-5 minutes. Add the onion, salt and pepper. Sauté until the onion is softened, 5 minutes. Add garlic, thyme and sage and sauté 1 minute. Add the kale and continue to sauté until the kale is beginning to wilt and soften, 5 minutes. Remove from heat and pour into a bowl to cool. Once the mixture has cooled to room temperature, add the lemon juice and cheese. Stir to incorporate. Open the deboned turkey breast with the skin side facing down. With a sharp knife, butterfly the breast like an open book. Salt and pepper the turkey and place the prepared stuffing mixture over the meat. Starting with the short end to ensure a nice roll, roll up the breast. Use 6 10-inch pieces of bakers twine to tightly secure the roulade. Place in a roasting pan. In a small kettle, melt the remaining four tablespoons butter with the two sprigs of thyme and three sage leaves. Allow to steep 10 minutes. Brush the entire roulade with the melted butter and place in the preheated oven. Roast until the skin is dark brown and the meat registers 145 degrees on an instant-read thermometer in the middle of the roulade, about one hour to one and a half hours. Remove from the oven and tent with foil. Let the turkey rest 20 minutes before slicing to allow the juices to redistribute.